BARANGAY Ginebra games and practices draw people from different walks of life, brought together by their love for the PBA’s most popular team. Gin Kings activities also brought two people together to find love. 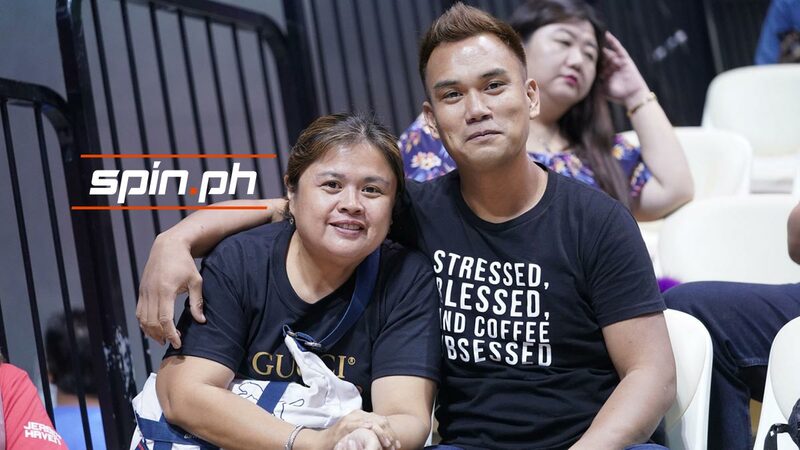 Janette Boncay and Gilbert Gante Manacmul are die-hard Ginebra fans and have been supporting their favorite team for more than a decade – although with separate cliques before they became a couple. Still, it’s a wonder that they only officially met last year. But outside the team, she described herself as a “dead kid,” usually preferring to be by herself when she cheers for the Gin Kings, so much so that she’s not even a member of any Ginebra fan group owing to a previous negative experience. “Yung naging trauma ko sa ibang fans, naglagay ako talaga ng blockage,” Janette shared in a chat with SPIN.ph at halftime of Ginebra’s Philippine Cup debut this season at the Philippine Arena in Bulacan where she was watching with her boyfriend. Gilbert had actually noticed Janette for a while and her mysterious ways caught his fancy. Finally, they met officially through a common friend and fellow Ginebra fan during a Gin Kings game at the Smart-Araneta Coliseum mid last year, before they started texting each other last August. They found out they share more things in common than being just Ginebra fans, like being coffee lovers. “Marami kaming common denominator,” Gilbert said. So after being reserved for so long, Janette finally opened up to Gilbert as they became a couple last September, a few days after the death of Janette’s dad. After being so near yet so far during Ginebra events for so long – they finally found each other last year. Janette is a dentistry graduate and former OFW who now works in the communications department of a local TV channel, while Gilbert is a mall department store employee in Pampanga. The nature of Gilbert's work does not always make him available to watch Ginebra games during weekends. Still, they try to make their budding relationship work. “Matagal 'yung walang relationship for both of us, so may mga struggles, pero pag mahal mo nga siguro, nandyan lang din talaga yun,” Janette said. “Syempre siya to, di ba?” Gilbert butted in. “May kanya-kanya kaming set of friends, so yung sa ’kin, medyo pilyo, sa kanya, medyo straight, so parang hindi nagba-balance. Pero mina-manage pa rin namin siya." “Ganun na nga,” Gilbert concluded with a smile.